A time-tested strategy for independent bands to gain buzz and build an audience: releasing a few singles, playing a lot of shows, becoming the toast of many reviews. Temples, the UK quartet from the English Midlands, find this strategy paying off for them with the release of a full album not yet due until the second week of February. But unlike many bands who follow the independent band strategy, Temples are well worth the hype, as they demonstrated in an extraordinary eight-song set at DC9 on Wednesday, Nov. 27. Listening to Temples’ SoundCloud page in preparation for the show, as I did, prepares you for a band with rolling melodies and a lush full sound. For example, their latest single, “Keep in the Dark,” offers some great melodies among band members and some really pleasing psychedelic guitar riffs. So it’s no surprise that it’s a good song—one apparently a catchy acknowledgement of the comforts of staying up late as well as perhaps remaining unenlightened. But the live show simply takes it to another level. The four gents–vocalist and guitarist James Edward Bagshaw, bassist Thomas Edison Warmsley, drummer Sam Toms and keyboardist Adam Smith–play so well together that the band often seem to move as one. If you listen to their music online or on vinyl, and you are impressed by the easy complexity of their sound, know that Temples are definitely a band to see live. They remarkably sound even better performing live than they do in the studio. The band played with confidence and competence but just as importantly they were having fun. Wednesday’s set also included “Sun Structures,” the title track of the upcoming album; “Colours to Life,” evoking thoughts and feelings as rich experiences; and “Shelter Song,” a song about finding comfort in companionship. Thematically, the band likes to explore variances in literal and metaphorical meanings for light and dark, day and night, and sun and stars. Each side offer appealing attributes, but at the end of the day, as the title Sun Structures implies, it’s better to walk in the warmth of the sun. Hats off to opening band Myrrh Myrrh, DC shoegazers who soldiered on with their performance despite the loss of their singer. Apparently, she quit the week before the performance, leaving two gents, Victor Arce and Tyler Butts, to play an instrumental set without any vocals. They managed to hold the attention of the crowd, and so their daring move certainly seemed to pay off! Hopefully, they will regroup with a new lead singer soon so they can show us the full power of their songs. 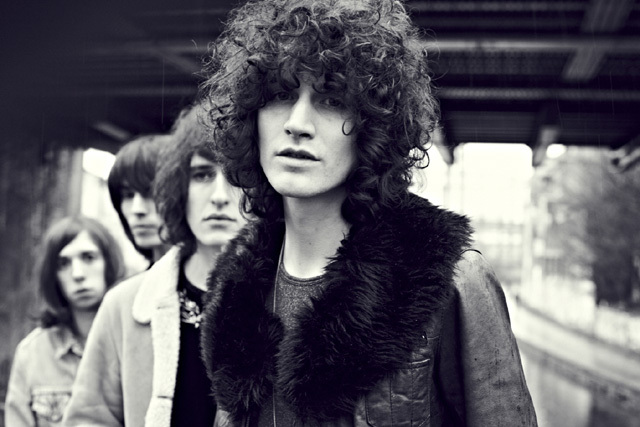 Temples have wrapped up their dates in the United States already. They return next to the United Kingdom, where they will open for Primal Scream. Mark my words, however, that they will not be opening for (admittedly awesome) other bands for long. They certainly will be playing bigger shows and bigger venues next time around.